You can enjoy Keurig Kcup coffee for as low as $9.99 per box with this weeks Wacky Wednesday coffee sale! 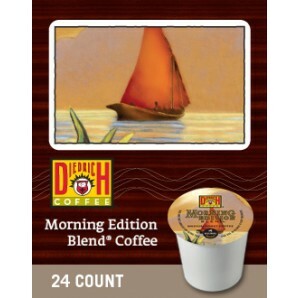 Diedrich Morning Edition Keurig Kcup coffee– $9.99 per box of 24! A medium roast coffee with subtle vanilla hints, spicy aromas and hearty finish. Green Mountain Hazelnut Decaf – $11.99 per box of 24! Buttery and sweet with the rich flavor of warm roasted nuts. Don’t forget you will receive free shipping when you spend $59 or more! National Coffee Day Celebration And Sale!